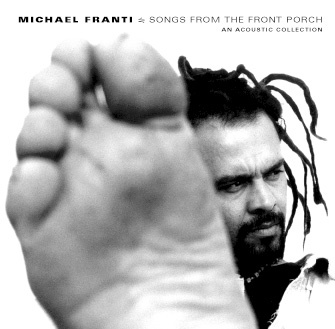 Michael Franti's career has already been through more stylistic revolutions than most artists get to try in a couple of decades, ranging from the avant-garde beats and political harangues of The Disposable Heroes of Hiphoprisy, to the various shades of down-home funk-soul and swingbeat employed on his Spearhead albums. Rather than another new beginning, Songs from the Front Porch may just be a one-off diversion: subtitled An Acoustic Collection, it features mostly previously released material reconstituted in new, low-key settings of acoustic guitar and hand percussion. In several cases, the result is to apply a more Latin American flavour to the material, with the light Tropicalismo tone of "Love Invincible" in sharp contrast to its original slinky disco incarnation on last year's Everyone Deserves Music. But the most noticeable effect of the new arrangements is to emphasise Franti's similarities with the great Gil Scott-Heron. As with Scott-Heron's poetry, there's a timeless contemporaneity to Franti's political sentiments, with a line like "You tellin' the youth don't be so violent/ Then you drop bombs on every continent" (from "Oh My God") as pertinent now as ever.